My husband and I got married at the Conrad Botzum Farmstead on 10-6-18. Words cannot describe how amazing this venue was! Beautiful scenery and a perfect place to for two outdoorsy people to get married. George and Maureen are extremely professional and detailed oriented. Maureen was organized through the entire planning process and knew exactly how to coordinate everything (especially when I didn’t). Both of them are friendly and willing to work with what you have as a vision. They were always in communication with us and got back right away if we left messages. They covered a lot of the behind the scenes action during the wedding day and made sure everything ran smoothly. We highly recommend this venue to get married at!! The Conrad Botzum Farmstead is an incredible venue, and the owners, George and Maureen, are fantastic hosts. Maureen helps with more than you can even imagine needing help with!! Maureen is experienced, professional, and a pleasure to work with. Maureen knew how to hand every little issue that inevitably came up, and helped me have fun with the whole planning process. My guests have been giving me endless complements on the venue and the overall vibe that Botzum brings to the occasion. I cannot recommend using this venue enough. I hope I have an excuse to come back or plan another party here! Maureen and George and their staff were amazing. The attn to detail, attentiveness to our wants and needs and plan was seamless. Katie and Tim Wright had a magical reception and our guests were well cared for. Couldn’t have been more perfect. Thank You isn’t sufficient for our experience !! Betsy, thank you for sharing your thoughts about Tim and Katie's special day. You guys were great to work with, and we hope you will come back to visit. It was a beautiful and special day. Thank you again for choosing The Botzum Farmstead! God bless the kids as they start their life together. If I could give the Conrad Botzum Farmstead and their wonderful owners six stars instead of five, I absolutely would. My husband and I are beyond thrilled with our choice to get married there and feel so blessed that we also got to know Maureen and George throughout the process, too. The venue is absolutely gorgeous and truly one of a kind. So many guests commented about how magical the space felt. 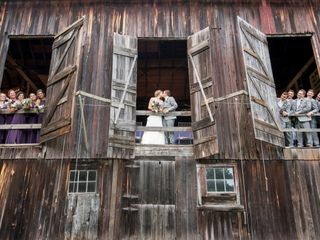 We loved the open air concept and really couldn't have been happier with the barn and grounds. We opted to have a bonfire at the end of the night which was also a big hit, along with the fact that you can dance outside and truly enjoy NE Ohio's weather with such a unique experience. Our photos also came out beautiful and we know so much of that is the beauty of Botzum. Maureen and George were also such a high point for us. They were responsive, thorough and truly made us feel like we were part of their family. They were willing to work with us and happy to answer our questions throughout every step of the planning process. A big part of the charm of Botzum is them. Getting married at Botzum was one of the best choices we made in regards to our wedding. I know that we’ll look back at it fondly and I couldn’t recommend it more. This venue is one your guests won’t forget and will be talking about for weeks after. Ours still are! This place was absolutely perfect. George and Maureen were extremely helpful and helped us with every step of the process. Maureen is a seasoned veteran when it comes to weddings and she was able to plan for every aspect well ahead of time. They are friendly, easy to work with, and their property is amazing (and by far the most reasonably priced that we found). 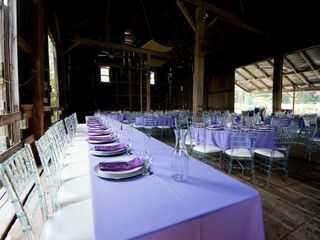 I would highly recommend this venue to anyone who wants an outdoor/barn/woodland wedding. My fiancée and I were planning our October 3rd for several months but at the last second, we were hit by a hurricane. The weather was consistently in the 70s/80s leading up to the event but we were locked into a high of 48 degrees with rain. My fiancée was obviously concerned about the weather ruining our event. Maureen was proactive and made arrangements to get an additional heater for the barn as well as come up with contingency plans to deal with the inclement weather. 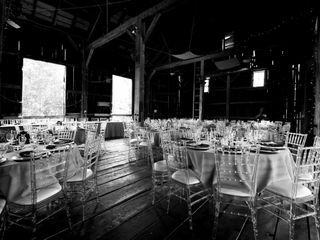 We chose the Botzum Farm for our wedding because it was exactly the kind of venue we wanted – it really was the perfect site for us, as we envisioned a good old fashioned, laid back barn party. 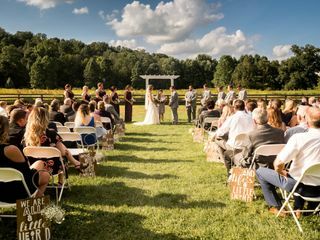 If you’re seeking the most beautiful rustic setting for your wedding, then the Botzum Farm is it! Maureen and George Winkelmann are in charge of the farm, and they’re truly a pleasure to work with – you’d be hard-pressed to find more kind, helpful, fair, honest people. Maureen is an expert at what she does, she is very knowledgeable and thorough and has a great attention to detail. Maureen was a huge help throughout the nine months of planning leading up to our wedding, always available by phone to answer questions and provide guidance and recommendations. George and Maureen were on site the day of our wedding to ensure set-up was completed properly and smoothly and that all our vendors could get in at the needed times. The greatest praise I have for them stems from a mishap on our wedding day. We hired a bus to transport our guests from the hotel to the venue, and unfortunately, the bus driver ran the bus off the road at the bottom of the driveway. George and Maureen and the farm staff all snapped into action to help get the issue resolved as quickly as possible and make sure our guests were safe; if not for Maureen and George, the incident would have been a huge mess. Without getting into all the specifics, they really went above and beyond in so many ways. By the time our wedding was over, we were feeling as if George and Maureen were part of our family. We loved the service we received, we LOVED this beautiful venue, and so did all our guests. Every one of them said it was the best wedding they had ever attended. I literally cannot say enough good things about our experience with the farm. If we had it to do all over again, we’d pick the Conrad Botzum Farm a hundred times over!! Wow...do we remember the bus. You and your guests were amazing. What could have been a very difficult situation, turned out to be memory maker. You were wonderful. Thank you for the great review. We wish you all the best in your life together. God bless you and your wonderful family! I feel compelled after reading some reviews that are out there to share my own experience at Conrad Botzum Farmstead. From the planning stages to the day of, we had an incredible experience with the Botzum Farm. George and Maureen could not have been more helpful and they were very communicative, often times reaching out to us to see how our planning was going or to help us with certain aspects such as organizing rentals for the big day. They were there for us the day of to make sure everything went smoothly and were even able to set up and tear everything down for us before and after the wedding for a small fee, which allowed us to enjoy the evening and not burden ourselves or friends/family with these details. We found them to be flexible, approachable and fair and it is truly apparent that this is a business that they love to be a part of. That being said, perhaps those who did not have a similarly positive experience did not fully understand the venue they were signing up for - it is a farm in a national park, which is also part of someone's home. It does require a bit more planning, organization and respectfulness than other full service, commercial venues. We found that to be part of its charm. This morning, my husband and I watched our wedding video back for the first time and once again, I was absolutely blown away by the beautiful day we had at Conrad Botzum Farmstead. The venue was a gorgeous backdrop for our big day, and I can honestly say that there was not a single thing that I would change. We continue to hear from friends and family members who tell us that they have never been to a more beautiful or unique venue, and I have to agree. I cannot imagine a more special place to be married. Annie, you guys were the best couple to work with, and had such a great and wonderful day. It was so good of you to come back and visit with us. May God continue to bless your life together. I will never forget October 23, 2010 beacuse that is the day my husband and I were married at the most conceivably beautiful place around - The Conrad Botzum Farmstead! From the moment I saw the farm, I knew there was no other place I would want our wedding to be. My husband agreed and that was that; we began planning. Right from the start, the owners of the farm were a tremendous help. They love the farm so much and want nothing more than to share it with others and give every bride (and groom) a day they'll never forget. I can honestly say I felt like a special bride. Their close attention to detail and careful condsideration was extremely appreciated. I felt that they were very accomodating and polite. I truly appreciated their help as they know their farm and what works there. On their recommendation we had an excellent caterer (Moes is awesome!) and they got us a great deal on the rental of tables and chairs (and we checked around for pricing). The staff at the farm went above and beyond being helpful. Any time I left a message, it was returned and no questions went unanswered. It was in our contract to set up and clean up, yet the owners helped us. We were truly grateful for their kindness. Also, yes a husband and wife team do run this business and I must say they really should make more money for all the work they put in to this. If you were thinking of getting a wedding planner and a hall and everything else that goes in to putting a nice wedding together, you'd be paying much more than you are paying Botzum and it wouldn't be half as nice. They are so helpful, not for the money, but because they truly love what they do. And they're great at it. If we could do it all over again, we would! Our wedding was spectacular and even now our friends and family tell us it's the best wedding they've ever been to. Thank you to the Winkleman's and Botzum for giving us our dream wedding! Thank you Kristen for your great review. I remember when I had to take the broom out of your hand 'cause you wanted to sweep out the barn. You guys were great to have as guests at Botzum. It's been so great that we have remained friends over the years as your family has grown, and Maureen and your mom have had many coffees together. God bless! Thank you Lisa. It was good to see you guys again after all these years. Wishing you all the best as you continue working on your house in Richfield. And thanks again for wanting to come back for your 15th. Come back and see us again...anytime! 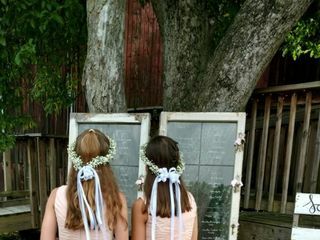 Conrad Botzum Farmstead was a wonderful place to get married! Maureen and George were so easy to work with. Maureen is extremely organized, detail oriented, professional and knows what she's doing! She was ready with suggestions, ideas, and vendors when asked but she never made suggestions without my asking first and I never felt any pressure about the choices I was making. Underneath this professionalism, she is warm and kind and genuinely cares about the couples who get married at their farm. 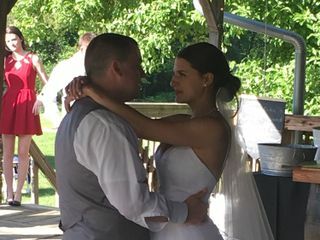 I did not feel like just another booking, I know that she truly wanted to help us have the most perfect day possible. George is the perfect compliment to Maureen. He is easy going and has a twinkly kindness to him that instantly makes you feel at ease. The day of our ceremony he was there from start to finish, helping make sure everything ran smoothly. And everything did run smoothly! The grounds are maintained impeccably but in a way that maintains the natural rustic charm of the farmstead. Pictures cannot fully capture the beauty of the venue. Our guests repeatedly told us it was the most beautiful wedding setting they had seen; seriously our pictures are ridiculous . 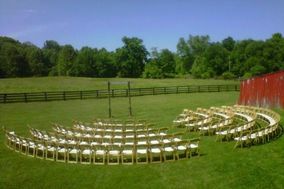 If you are looking for an outdoor venue you have to check this place out to see for yourself! The bathrooms are really nice so no worries there : ) It did require additional set up and tear down work compared to traditional venues but it was all well worth it! I highly recommend this setting and was extremely satisfied!!! You guys are the best. It was so much fun hosting your special day at Botzum. God bless you in your new life together. George and Maureen really work wonderfully as a team to make your day absolutely beautiful! Maureen is extremely knowledgeable about all of your wedding needs and helping you prepare for your big day. She offers excellent support and guidance during the wedding planning process. George is an extraordinarily hard worker and will do everything he can to ensure that the property is gorgeous and your wedding set up is done to perfection. Beautiful setting for a wedding. Maureen & George were involved in every detail that we needed, both planning and the day of coordinating. LOVED getting married here!! I will preface this by saying that Botzum is a GORGEOUS place. We got so many compliments, and it really is a unique, lovely, perfectly rustic setting. Our wedding day was beautiful and when everything came together I couldn't imagine anything more perfect. I don't want to put off anyone from booking here. I rated my experience a 4.2 for a reason. It's important to understand, though, that the planning process was a little less sterling than I would have hoped. Maureen is great at organizing and keeping you on track - but I underestimated the amount of stress (and extra cost) having my wedding there would be. Brides considering this venue should have accurate expectations. When you rent with Botzum, the rental cost they give you is just that. The rental cost for the place. It doesn't include tables, chairs, linens, a bar, coolers, flatware, twinkle lights, etc. These are all things that you will have to rent or provide yourself. It doesn't include setup - you can pay (a steep fee) for them to setup and tear down, and they'll require you to reserve additional rental time for that setup (as well as for your rehearsal). In the end it was worth it to us to offload the work to maintain our sanity... but expect to add an additional $2,000 or so for all of those things (even for a small wedding). Finally, make sure you know where your trash is going at the end of the night - because they require you take it off site. That was a huge point of stress for us, and something no bride should have to worry about a week before her wedding day. This is not a budget venue. You're going to pay just as much as you would for an expensive venue, and have to take care of more of the work. It is absolutely STUNNING. But if you're looking for a stress-free venue without a ton of coordination, find a place that does all of your settings and bar in-house or hire a wedding planner. I'll have to make this short and sweet since while typing my initial review of this place, I ran out of room in this box to type anything else. First, very beautiful venue, especially if you're going to have a fall wedding as the leaves were already changing. Lawn very well manicured, cars parked out of sight lines of any pictures. The woman in charge of the venue is hard to get a hold of. Expect her to not return calls for a few days sometimes. She's nice and will tell your fiance not to be stressed and everything will be ok and look great and the next phone call your fiance will get bombarded with questions faster than she can answer them. It is also a possibility for you fiance to get nailed with questions while she's pulling up to the venue in her dress to get married as that was the case with us. You will get nickel and dimed by this place. You will have to rent extra time to decorate and unless you plan to do it, you will have to hire them to set up and take down once the night is over. They only use 3 preferred caterers and charge extra for any different caterer. They offer a bonfire for a pretty hefty price as well. And by bonfire, I mean a fire that's smaller than a fire you can have in your fireplace in your living room in a fire pit that is a rather huge circle. We chose to use hay bales for our guests to sit on during the ceremony and the proprietors made us have people come in to rake any loose straw up DURING the cocktail hour. Bottom line is, the setting is absolutely beautiful and we got compliments from everyone, but it's not worth the money you spend to book this place and then the extra money you spend for all the other things. 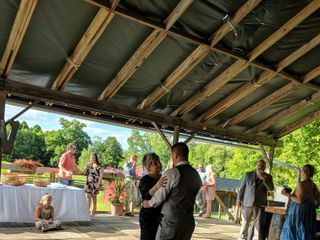 Please keep your options open when looking at venues because I'm sure that somewhere in Ohio you will find another outdoor farm venue that's just as nice and significantly cheaper. We would like to respond to this review, not with bitterness, but with curiosity. We have hosted over 650 weddings and receptions at Botzum, and we have never treated any one client any differently than any other. Every client hears and understands (we hope) the same conditions and requirements for the Farmstead. It is hard for us to understand how we can get 4.5's and 5.0's and then get this. We are extremely sorry for someone having had a bad experience. It would have been more fitting to have said something at the event, than to have criticized us publicly with no opportunity to remedy. All charges and conditions are explained up front, and we do everything we can to not have any surprises. It is difficult to get our arms around the fact that in treating all clients the same, some brides find Maureen so helpful and others find her 'bombarding' and 'nailing' them with questions. We go out of our way to be helpful...at least we thought we did! We are extremely sorry if someone has an uncomfortable experience at The Botzum Farmstead. Picturesque and that's it. The owners make you feel like you will destroy their property and follow you around just to make sure you don't. Mosquitoes are horrible and the owners don't warn you beforehand. The owners also walk around in their street clothes while everyone looks like they are attending the wedding. It was appalling to watch them walk around in street clothes. What if they made it in a wedding picture? The owners make you feel like you are getting kicked out. They started tearing everything down at 10:30 pm and we had the venue until 11:30 pm. I would never recommend having an event here. We would like to respond to this review, not with bitterness, but with curiosity. We have hosted over 650 weddings and receptions at Botzum, and we have never treated any one client any differently than any other. Every client hears and understands (we hope) the same conditions and requirements for the Farmstead. In 16 years of rentals, we have never had such strong comments regarding mosquitoes, and everyone knows that pesky bugs are a possibility, and we have never 'kicked' anyone out of the venue. In fact we have always gone out of our way to accommodate our clients schedule and wishes. If they have run into a time crunch, we tell them not to worry, no one is watching the clock. It's OK. Also, we always wear the same thing, usually khaki or jean shorts and green polos. We do not, in anyway, try to dress like we are part of the event. And, other than for set-up, parking, and take-down, we try our best to stay out of the way. We are a 150 year old farmstead, not a club or hotel. It is hard for us to understand how we can get 4.5's and 5.0's and then get this. We are extremely sorry for someone having had a bad experience. It would have been more fitting to have said something at the event, than to have criticized us publicly with no opportunity to remedy.